I dabble as an editor on Wikipedia sometimes. Yeah, I know it can't be trusted any farther than it can be thrown, but I enjoy contributing when I can. 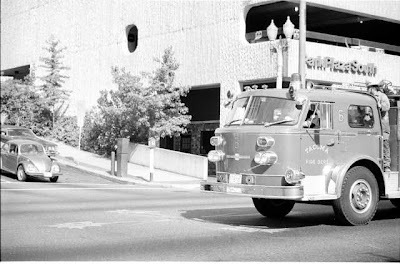 I noticed that the Wikipedia entry regarding American LaFrance, while making light of the easily recognizable appearance of these ALFs beginning with the Type 700 on up through the Century 2000, did not actually have any photos of these rigs. I'm changing that. Engine 17 is now the relatively anonymous model for the Type 900, with no links back to here of any kind. Got examples of the 700 (obtained permission) and Century 2000 (my photo) in there so far as well. Waiting for permission from a guy at the ALF Owners to use a great picture of his mid-70's Century to fill the last big hole. Also missing a Type 1000, but they are so close to the 900s that I doubt it matters. So... just who is that guy in the Century 2000 pic, anyway??? That is, the 1970 era and forward a bit. Since I still do not have early pictures of 17, I'll have to paint it for you using other photos. I'll probably go off on a lot of silly tangents. I apologize for that in advance. This Mack is the sort of piece that was front line when Fire Station #17 was opened in 1955. This is one of a handful of apparatus that the Tacoma Fire Department has quietly held on to. They also kept one of Engine 17's sisters, though I don't know yet which one it was. My Engine 17, the dalmation-painted engine in Florida, and the one Tacoma still has, accounts for three of the eight sisters, leaving five unaccounted for. I suspect that at least one was stripped for parts while still with Tacoma, but I am not sure. Anyway...see, I digress! So... about this Mack, I can't see which unit this is marked as, but I am going to use this era's door markings to go forward. The circle reads TACOMA on top and FIRE DEPT on the bottom, and has the unit number in the middle. I think it might say No. 5 but I am not sure. Not that it matters for this ramble. Moving forward about fifteen years, here is one of the famous (in my mind) eight 1970 American LaFrance Type 900 sisters, one of which is my Engine 17. Times were different then... note the firefighter standing in the jumpseat well behind the cab, looking over the roof. 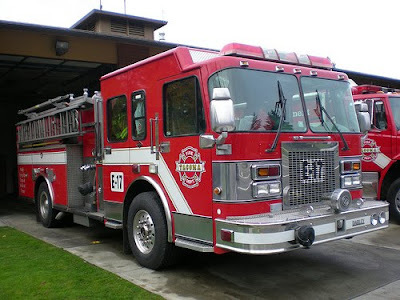 This sister was marked as Engine 6 when the photo was taken, and shows the door lettering that would be used on all new deliveries at least through 1980. Note also the hand-painted unit number on the nose, and between the windows on the side. 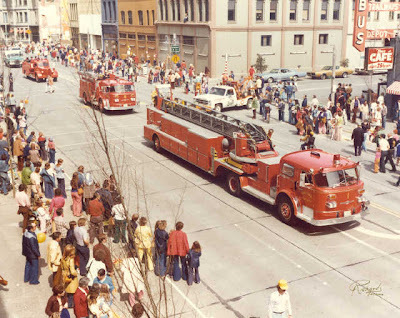 The next two photos are from the 1974 Daffodil parade. 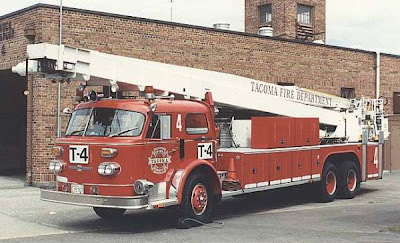 When Tacoma obtained the eight sisters, they also took delivery of two Snorkel truck companies and a tiller-drawn aerial (TDA) ladder truck. Actually, two TDAs were ordered, but one of them was damaged when the train it was being shipped on derailed. American LaFrance offered to repair it, but Tacoma opted to wait and get a new one (which was eventually delivered in 1972), while the damaged aerial was repaired and sold to another fire department. Anyway, these two photos show one of each of these types of units in their original livery. Right around 1983 or 1984, Tacoma decided that the old-style lettering was not visible enough at distances. The solution was to fit each unit with large, reflective company numbers. You saw an example of this a couple of posts ago in the old photo I found of Engine 5 (shown as assigned in later years to Engine 8). What you can't see in this photo is that the side numbers on the cab between the windows were allowed to stay, and the large reflective number was placed on the bottom rear compartment doors on each side. At least the original door paint remained. The rig below was originally Truck 3. When it got its huge reflective numbers, the hand painted stuff was allowed to stay for the time being. 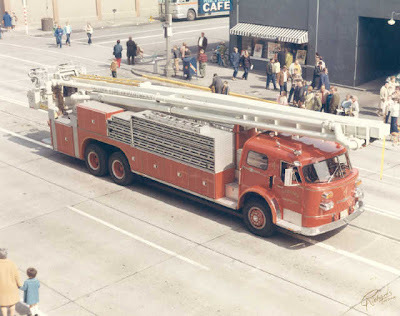 The Snorkel boom on the identical Truck 4 was later damaged and removed, and Truck 4 took the identical rig from Truck 3 when Truck 3 got a new and much shorter rig better suited for north Tacoma in 1980. Oops... another tangent... so anyway, when old Truck 3 got assigned as Truck 4 later, the hand-painted "3" between the cab windows was replaced with a smaller version of the reflective decal concept at the same time that the rear big decal was swapped from a "3" to a "4". The hand painted door lettering was also removed, and replaced with Tacoma's new standard maltese cross door insignia - a design still in use today, over 20 years later. When the fad of huge reflective numbers wore off, Tacoma moved forward again and adopted the concept of interchangeable placards, a system in use all over the country today. This was actually a good change. Now, swapping units was easy when crews had to exchange units when relieving each other after long incidents, and especially when using a reserve rig. It was no trouble at all to slap your company ID on whatever unit you were going to use. So ... anyway, here is Truck 3 during its later time as Truck 4, all hand lettering is gone, the reflective number decals are still there, but made redundant by the new placards. That's progress. It ain't all bad, I guess, but for the work I hope to get done on Engine 17, I want that original hand-painted look. I will throw crucifixes and garlic at large reflective decals and placards. I am trying to obtain photos of Engine 17 during her service life with Tacoma, at any time of her career as E17, E9 and E10. They exist, but can I get access to them? We'll see how it goes. The request is out there. In the meantime, I have been scraping together photos loosely related to 'my' Engine 17 to entertain you. Today, some history on Fire Station 17. 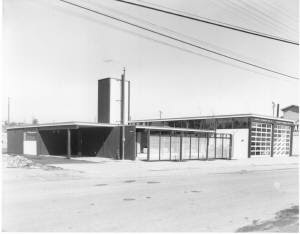 Construction of Fire Station #17 began in 1954, just east of the intersection of South 35th Street and Union Avenue. 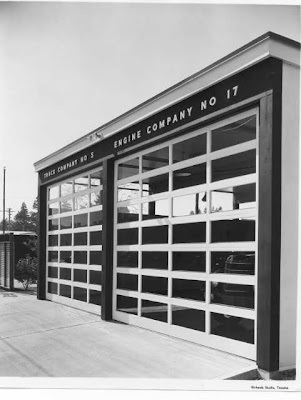 When completed and opened in early 1955, Tacoma established Engine Company #17 for the first time. 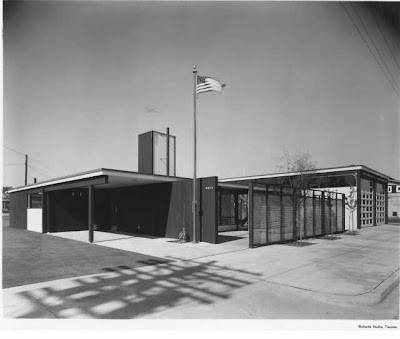 The 1955 opening of Fire Station #17 expanded the fire department to 18 stations (counting the fireboat station). 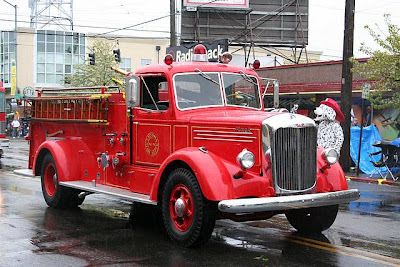 Station 17 was also intended to house the not-yet-established Truck Company #5, but it never happened and Tacoma still operates to this day with only four ladder companies. The addition of a handful of other unstaffed specialty units. Overall, the department lost one fire company, one fireboat company, and one rescue company, while gaining five ambulances, amounting to essentially no change in the department's staffing since 1955. Take the 1955 staffing levels, and then apply the enormous increase in call volume since then due to the assumption of EMS calls (which usually make up about 80% of a fire department's call volume). Then apply the growth of Tacoma from around 137,000 people to over 203,000 in those 54 years, an increase of over 32%. And then apply the assumption of fire protection for the Cities of Fife and Fircrest (combined 2009 population 14,000 pushing the covered total population to over 217,000), and you have the Tacoma Fire Department handling exponentially more calls, covering a population increase of nearly 40%, and doing so with the same number of personnel and apparatus available in 1955. Wow! Anyway.... back to the interesting Engine 17 stuff. 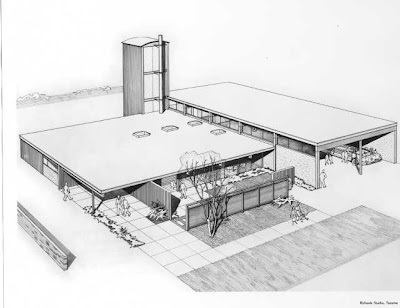 This architectural drawing of Fire Station #17 is pretty close to how it came out. Here are some pictures of Station 17 shortly after it was completed. You can see the reference to the hoped-for but never realized Truck Company #5 over one of the bay doors. Tacoma's Engine 17 was relocated to Fircrest when Tacoma assumed their fire protection by contract in 1995, thus the station formerly used by the Fircrest Fire Department became the new Tacoma Station 17. The old Station 17 on 35th Street, having served its intended duty for only a short 40 years, was remodeled into administrative space and is now the home of the fire prevention division. You can see what it looks like today via Google Street View by clicking the link below. The building's footprint has been expanded into the original covered outside area, the hose tower has been removed, and there is a wall with small windows and a door where the large glass truck bay doors used to be. Driving by, you'd never guess what it used to be except for the curb ramp inexplicably leading up to the wall where Engine 17 used to pull out. 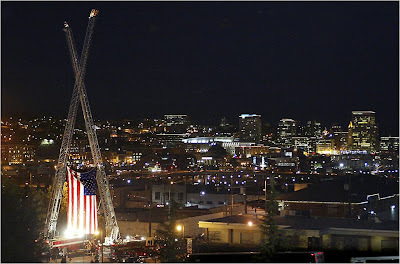 When we come back.... pictures of older Tacoma fire apparatus similar and related to Engine 17. "Look us up on Facebook." "Be our fan on Facebook." 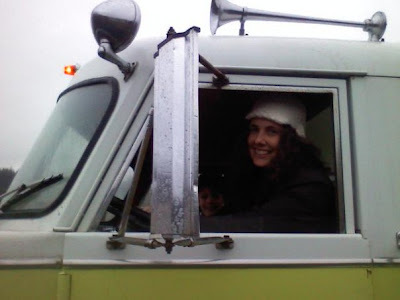 But just to keep this post interesting, here is a picture of the lovely Mrs., who drove Engine 17 for the first time this weekend. She's never driven anything larger than a full size van before. She was a natural, took it right out on the open road and navigated with ease. Back when I picked up Engine 17.... the Mrs. was very forgiving when she heard I wanted to drop a chunk of change to buy an old fire engine ....(well, I greased the skids by buying her the grand piano she'd been asking for). We'll be paying both of these off for a while, but it was worth it. Found this today while going through a bin of photographs. 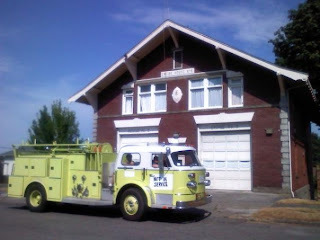 This is 17's sister, Engine 8, in front of Fire Station 8, just a few doors down from where I grew up. The station in that old picture might look familiar, as I snapped a quick photo of 17 in front of the now-closed old Station 8 when I picked her up this summer. 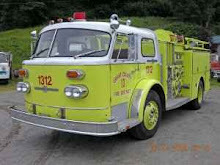 When the 1970 rigs were new, they had hand-painted unit numbers above the 'American LaFrance' nameplate on the nose. It was just before that old picture was taken that the front numbers were buffed off (argh!) and replaced with those huge reflective numbers. It was a fad. A few years later the department switched over to the interchangable placards now commonly used all over the country. Anyway, it is that beautiful red finish and hand-painted door decals and numbering that I hope to get back on 17. When I compare these pics... sigh. Big job. A little bit of closure, on something that will never fully heal, came yesterday as the memorial service for the four fallen Lakewood police officers was held in Tacoma, at the Tacoma Dome. I really wanted to attend, but my work schedule interfered and I could not arrange coverage. I was very unhappy about that. Had I been able to attend, Engine 17 would have gone along to participate in the group of fire apparatus in the procession. You see, Engine 17 is familiar with that area. If you've read the blog all along, you know that 17 was later reassigned to Engine 9 and finally to Engine 10 before leaving Tacoma. Station 10 is Tacoma's southernmost station, just north of Parkland and northeast of Lakewood. 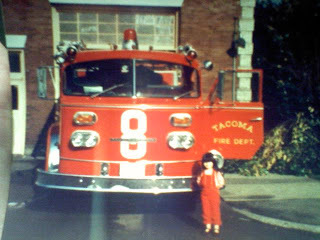 17 spent nine years in south Tacoma as Engine 10, occasionally running into Parkland and Lakewood on mutual aid. In fact, Tacoma Station 10 is less than four miles from the site of the shooting. If not assigned on the first alarm there out of 10's, 17 was close enough to be on the 2nd. This was 17's last neighborhood in Tacoma, and a casual afternoon bike ride away from where I grew up. 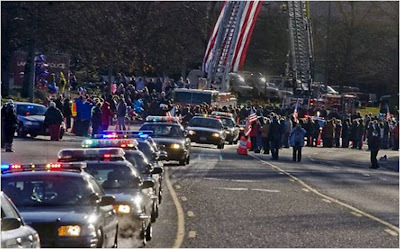 While sorry I missed the memorial, I am praying that there isn't a next time to make up for not being there. Brothers in blue, thanks for what you do.